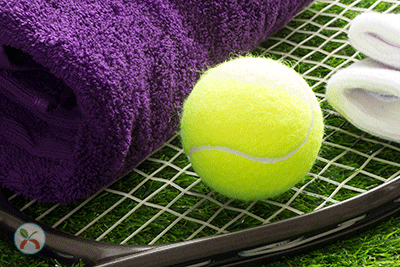 How about adding a little tennis to your corporate wellness program? This month, hundreds of the best tennis players in the world competed in the Wimbledon Championships. About 475,000 fans attended the events, and millions more watched the matches on TV and digital devices. While most people know Wimbledon is the oldest tennis tournament in the world, you might not know this Grand Slam event can teach you a few things about running a corporate wellness program. Chances are pretty good that Wimbledon has been around longer than your corporate wellness program. The first tournament was played in 1877, and it’s only grown in popularity over the last 141 years. Players and fans look forward to the event, and everything that defines Wimbledon culture. And you can learn something from it. But that doesn’t happen overnight. Creating a culture of health is a long game. Kind of like the 2010 Wimbledon match between American John Isner and Frenchman Nicolas Mahut that took 11 hours and 5 minutes to complete. But when you make a long-term commitment to create a culture of health, everyone wins. It may have taken Wimbledon officials more than 100 years to address a major complaint from players and spectators. But at least they did it. After years of rain and game delays during the tournament, a retractable roof was finally constructed to keep spectators dry and keep the matches on schedule. In tennis, when the ball goes out of bounds, or hits the net, it’s out of play. But not for long. At Wimbledon a ball boy or girl rushes across the court and grabs the tennis ball, so the match can continue as soon as possible. But to be a ball boy or girl at Wimbledon, you must complete an assessment first. This kind of population health data you can get from an assessment can help you make decisions that will keep your wellness program moving forward. Take a look at a concession-stand menu at Wimbledon, and there’s one food this tournament is best known for: strawberries. It’s been part of the event from the very beginning, and easily the most popular food among fans. During a typical Wimbledon tournament, fans consume an estimated 75,000 pounds of strawberries, picked fresh each game day from local farms. The same fans will chug an estimated 230,000 bottles of water and munch their way through more than 19,000 bananas. Obviously, there’s less than healthy food choices at a sporting event like Wimbledon, too. But the berries, bananas, and water are a nice reminder that healthy eating habits always win. Encourage your population to eat more fruits, vegetables, whole grains, legumes, nuts and seeds, and drink plenty of water, and you’ll be one step closer to winning at wellness. If you want your wellness program to make an impact, encourage healthy lifestyle behaviors, and improve population health, play the game. Create a culture of health. Adapt to the needs of your population. Encourage healthy diet and lifestyle habits. And use a health risk assessment. That’s how you win at wellness. Looking for an HRA for population health management? Check out this resource: Choosing a Health Risk Assessment.